The Crisis was published in Columbus, Ohio and edited by Samuel Medary. At the beginning of the Civil War Medary was sixty-one years old. He spent the previous 40 years of his life in politics. He spent one term in the Ohio House of Representatives (1834) and the Ohio State Senate (1836�38) as an Andrew Jackson Democrat. In 1838, he purchased a newspaper in Columbus, Ohio that he turned into the Ohio Statesman and was its editor until 1857. Medary was active in the proceedings at the 1844 National Democratic Convention held in Baltimore, where he was instrumental in the nomination of James K. Polk. In 1856, he participated in the presidential election efforts of James Buchanan. He was appointed by President Buchanan as the third Territorial Governor of Minnesota, serving from April 23, 1857 to May 24, 1858. Later he was the sixth Territorial Governor of Kansas from December 1858 to December 1860. He returned to Ohio and founded the newspaper "The Crisis" in an effort to thwart Unionist politics. The editorial position of the newspaper was that it was wrong for the federal government to seek limits on slavery and engage in warfare against the Confederate States of America. The newspaper promoted the politics of Northerners who sided with the positions and opinions at the foundation of the Confederacy, often referred to as "Peace Democrats" or "Copperheads." The Crisis borrowed its name from a series of broadsides published during the American Revolutionary War. Medary contented that the fight against British rule over the American colonies was comparable to the secession from the Union by southern states. 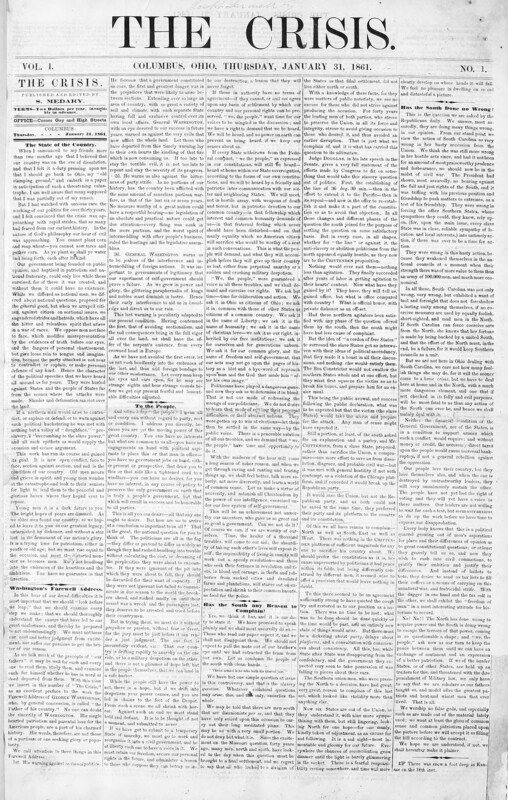 The weekly newspaper was five columns wide, eight pages long, with small print and single-column headlines. At first it did not carry advertising. After its first four months it began running ads, but only in its last two pages. The subscription price was $2.00 per year. In his first prospectus for the newspaper Medary said it would contain news of the week, public documents, speeches from both sides of issues, market reports, correspondence, and a summary of the proceedings of Congress and the state legislature. In 1863, the newspaper endorsed the candidacy of Clement Vallandigham for Governor of Ohio. At the time Vallandigham had been deported and sent to the Confederacy by the order of President Lincoln. Medary encouraged resistance to President Lincoln's policies, including conscription, martial law, and the first federal income tax. Robert Harper, author of "Lincoln and the Press," wrote that Medary published "one of the most widely quoted Copperhead newspapers of the Civil War period," and "was the acknowledged voice of the Peace Democrats." Medary opposition to emancipation and disregard for abolitionists was present in nearly every issue of his newspaper. In the January 29, 1862 issue of the Crisis he described abolitionists as "infidels in black coats and white neck ties, with Bibles in one hand and bowie knives in the other." When referring to African-Americans in print, he often used the most demeaning epithet possible. portion of the American people under the whip and spur of a set of fanatical and sectional politicians, aided and abetted by a wicked and reckless priesthood, who were seeking after a new God and a new Constitution to suit their evil designs. The Abolition Proclamation of President Lincoln, which will be found below, is a singular document to be issued in a country claiming to be governed by Constitutions and Laws. It is as much unlike anything else which ever emanated from the head of a government, civilized or savage, as its author is unlike any other man who ever rose from obscurity to an eminent position." The concept that a more unconditional freedom of the press was provided for by the first amendment of the Constitution had not flourished in the minds of Americans. A greater protection of free speech had not yet been affirmed in the courts, and would not be seen until the next century. On March 5, 1863 an angry mob destroyed Medary's newspaper office. Concern over the Crisis's perceived pernicious influence led postmasters in West Virginia, Kansas, and Missouri to halt its circulation in those states. Donna Dickerson, the author of "The Course of Tolerance: Freedom in Nineteenth Century America," wrote that, "The Civil War years added a great deal to the debate over the boundaries of freedom of press and even increased people's understanding of the vital role the press could play in times of upheaval." President Lincoln was concerned about both the inconvenience to governess caused by a free dissident press and the harm to liberties caused by censorship. Frank L. Klement, in his book, "The Limits of Dissent: Clement Vallandigham and the Civil War," cited a letter written by Lincoln in 1863 in which the President expresses, "Must a government of necessity be too strong for the liberties of its people, or too weak to maintain its own existence?" On May 20, 1864, Medary was arrested after being charged with conspiracy against the United States Government by a federal grand jury. Medary along with eight other Peace Democrats were charged with three counts of armed conspiracy. The claim was that the nine had planned and participated in an October 1863 plot to free more than thirty-six hundred Confederate prisoners from three locations in Ohio. Medary was convinced that the President, who Medary previously at least once wrote, "deserved to be shot," was behind the charges. He wrote in the Crisis, "It is just the thing for the tools of Lincoln's despotism to injure our paper, and that is all they care about." Medary died while released on bond on November 7, 1864, the night before President Lincoln was reelected. Medary's passing coincided with the passing of a type of journalism that was becoming less popular as the Civil War progressed. His brand of newspaper journalism based on editorial content from one individual was losing its appeal. The public on all sides wanted to know facts about the events of the war, what was happening to their family and friends in battle, how long would the conflict last, and who would win the war. Edward L. Carter wrote in his book "The Revolution in Journalism during the Civil War," that Americans, "demanded facts about the war, deemphasizing the traditional opinion function of the party press." 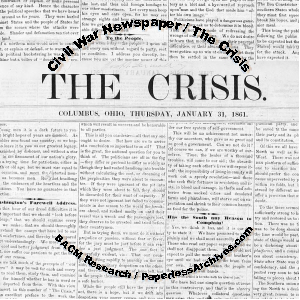 The Crisis newspaper presents a chance for the study of the history of American journalism, the Civil War, free speech and the First Amendment of the Constitution.